It’s said you should never judge a book by its cover. 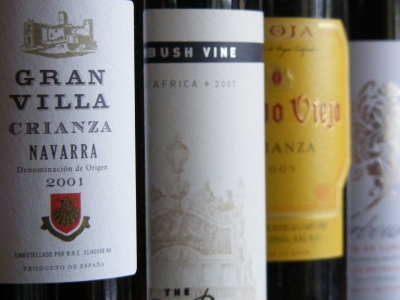 When it comes to wine the same holds true, although there are some very obvious exceptions. If you ever encounter a wine with a ‘critter’ label – one with an animal on it – most of the time you would be well-advised to avoid it. There are specific cases when this does not hold true – Frog’s Leap, Stag’s Leap and Duckhorn Creek are three examples – but more often than not the appearance of one of our furry friends on a bottle label can only mean bad things. Case in point: Yellowtail. Nevertheless, I have discovered on multiple occasions that it really is hard to judge something based on its first impression, no matter how strong your initial conclusions may be. I had this same experience with The Winemaker. This counted for when I first tried his wine and then when I met the man himself. Now, The Winemaker is a person I have written about once or twice in the past. I have alluded to his cosmetically challenged home, his collection of rather wild domestic animals and, of course, his unquestionable expertise in winemaking. When I first encountered a bottle of his wine at a friend’s house in Birmingham, the slightly kitschy golden label with black text made me raise an eyebrow. My first impression was that it had an old-fashioned, almost tacky, French label and, given that I had this experience back when I knew very little on the subject of wine, I have to confess I had my reservations. However, my scepticism was quickly extinguished when I had my first sip. This might not have been categorised as fine wine, but there was no question it was well-made. The man knew what he was doing. You see, The Winemaker came from a winemaking family that, as far as I understood, went back generations. His father owned vineyards, his siblings owned vineyards and I’m fairly sure the same held true for grandparents and cousins. He made wine the way his father did, and his father’s father did, and so on. He knew people and people knew him. Some of these people were owners of famous chateaux whose wines sell for hundreds, sometimes thousands of pounds per bottle. Yet he was a humble winemaker whose own produce sold for modest sums. That’s the French wine lake for you. But there was more to his life than wine. He was a conservationist who raised fish that were reintroduced into the wild. He had been a master of petanque in his youth, winning championships. And he played the drums in a Brazilian music and dance troupe. This man might have had a dishevelled appearance, but that was only because he simply didn’t care what people thought of him or the way he looked. He was The Winemaker and that was good enough for him, for his family and for his friends. I’d heard many stories about the things he had done and the people he knew. And I witnessed my fair share of unusual happenings. Whether it was the night he read my palm or the time my friend and I watched him corral the unruly pet donkey that had escaped his pen and dashed through the vineyards of Montagne, there were few dull moments at the vineyard. In short: He was a man who may have appeared on way on the surface, but was another person entirely beneath the scruff exterior. Any person who judged him based on appearances would have missed out. For his part, passing judgement was not his style. Certainly no wine was ever praised or scorned until a bottle had been opened and consumed. Until such time, he would only say, “Maybe yes, maybe no” when we showed him a bottle and asked for his thoughts. If a wine was good, it was praised. If it was less than good, it was criticised briefly before being set aside and ultimately forgotten. The man had neither the time nor the interest to carry on drinking something substandard. There is the old saying that life is too short to drink bad wine. For The Winemaker, whose life was shorter than expected, this was more than apposite.